Student Adventures: Open your mouth and listen up! Open your mouth and listen up! 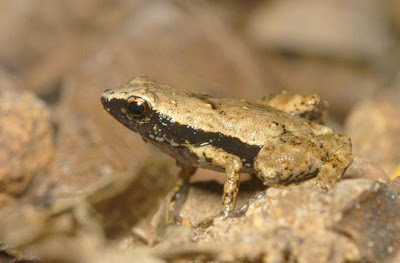 "A small frog native to the Republic of Seychelles lacks a conventional middle ear and eardrum to hear sounds made by other frogs, but new research suggests these peculiar croaker...s are not deaf, and can instead use their mouth cavities to pick up on noise. Gardiner's frogs from the Seychelles islands are one of the smallest known types of frogs in the world. These amphibians are seemingly deaf -- having no middle ear or eardrum to help process sound waves -- but can mysteriously still make their own croaking sounds, and hear the calls of other frogs. Click to discover how does this mouth-ear works: http://ow.ly/ovLV9"